Happy first day of fall everyone! I'm pretty sure that fall is everyone's favorite season including myn. From the leaves turning pretty colors to that chill in the air, it's just such an amazing time of the year. Of course after this season everything goes downhill haha. Upstate NY winters are brutal! But for now let's focus on the good. I got inspired and decided to do a fall essentials post featuring my favorite fashion pieces that will keep you warm and cozy. 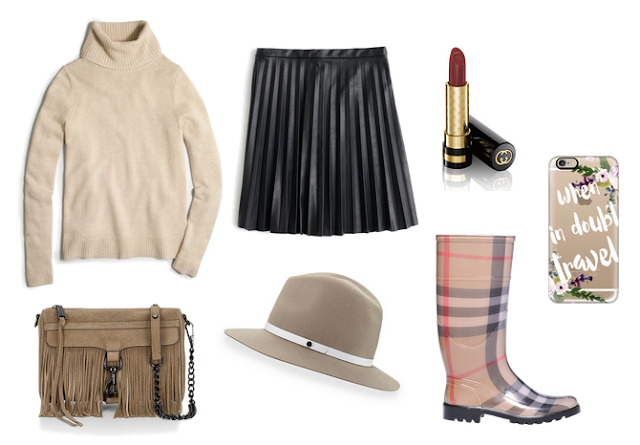 Every girl needs a good pair of riding boots, sweaters, and of course some fall lipsticks! Oh and let's talk about that Rebecca Minkoff suede fringe Mini Mac! I think a little fringe here and there can totally give an outfit a fun twist.